Hey everyone! Today I have the first part of China Glaze's new Spring 2015 collection to share with you! This collection is called Road Trip, and consists of twelve polishes total. I'll be showing you ten of those: four cooler-toned shades in this post, and six warmer toned colors in part two! 1) I apologize for the varying color values in my skin tone (especially in the collage photo above). That is merely a function of the photo's exposure and not the color balance. The two lighter shades, in order to be recorded accurately needed darker exposures. 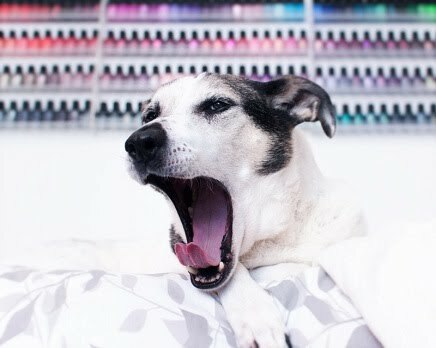 2) I've reduced the number of swatch photos per polish in this post. Because there are so many polishes to get through, I really needed to edit a bit, and just show you the most necessary photos. Otherwise, the volume of work for me will prevent me from moving on to other polishes sooner! I hope this doesn't disappoint anyone, but I think it's what I'll be doing from now on with large collections like this (especially if they are not press samples). Okay, now that that's out of the way, let's get started! First of all....the name! It just has negative connotations for me! Eeek. License & Registration Pls is a saturated medium blue crelly. This one has been color-corrected slightly in post to reflect the actual color! This is very similar to Zoya- Ling, but just a hair darker. So, if you have that, you do not need this! Formula: The actual consistency and texture of this is 100% jelly, but the level of pigmentation says "crelly" to me. It's on the thinner side, although very pigmented, and nicely opaque in two self-leveling, easy coats! My Way or the Highway is a medium, very green-leaning teal crelly. This can look almost straight-green in lower light, but sometimes it just appears teal. I didn't find an exact dupe for this in my collection, but it is reasonably close to Picture Polish- Marine. Marine is a little bit darker and less vibrant. Formula: It's very similar to License & Registration Pls: jellyish, shiny, self-levelling, and fairly opaque for the consistency. The second coat didn't self level as readily as the first, but it did even out- just sloooowly. Nice overall! Wanderlust is a pastel, medium-light lavender creme that leans slightly warm-toned. It also has the same pinky-golden shimmer as Dashboard Dreamer, which you'll see below. The shimmer is slightly more apparent in person than photos, but it's only there if you're looking for it carefully. It's subtle, and really just serves to give the finish a nice glow. This is a type of finish that I refer to in my head as a "near-creme." If you're looking for overt shimmer, this one is not for you. The shimmer is not really the star of the show, and I think any swatch photos that make it look really obvious are using some really high intensity light to get it to pop. That goes for all of the subtle shimmer shades in the Road Trip collection. Because of the warm shimmer, this appears as a warm-toned pink, which I usually don't love on my skin. I don't know what it is, but this one is an exception- I really like it! Formula: The texture is a bit thicker and not jellyish like the first two. The pigmentation is sheerer, and the first coat is streaky and sheer, but does self-level a bit. It dries down quickly, and the second coat applies a bit easier, although is still not opaque or streak-free. The third coat is an acceptable level of opacity for me, and overall, despite the three coats, I found this polish more workable and forgiving than most pastels like this I've tried. Dashboard Dreamer is a light baby blue creme filled with the same fine, goldish-pink shimmer. As you can see, this shimmer is just as subtle as Wanderlust's. It really just serves to give the finish a nice, subtle sheen, and is not a feature unto itself. I don't think this is necessarily a bad thing, btw, especially if you love creme finishes! Formula: It's slightly thinner than Wanderlust, but similarly sheer. It was nearly opaque with a second thicker coat, but I needed three to even out streakier areas. No problems with pulling or dragging, though! Overall: I'm pretty happy with these four shades! I am a bit disappointed that the License & Registration Pls and My Way or the Highway are near-dupes, but if you don't have colors like those in your collection, these two are the way to go. They are nicely opaque in two coats, but have the wonderful jelly consistency, which applies easily and also accounts for some extra shine! I like the two subtle shimmers, too! If you consider them cremes, they really are nice polishes, and for pastels, they have pretty decent formulas. I think you'll be disappointed, though, if you're expecting them to be overtly shimmery! Is subtle shimmer a drawback for you? Great swatches of them! They look pretty nice. So, yea, I just slightly dip the surface of the makeup sponge in some water...maybe not the whole thing. Then, wring it out a little. It doesn't need to be sopping, just damp. Then you would just apply your colors onto it that way. This way it doesn't absorb as much polish, and it kinda makes everything blend together more. Don't use polish thinner! Thanks, Lisa! I think so! My Way or the Highway looks so lovely on you! I really like Dashboard Dreamer a lot! In fact, I've been wearing it all week!